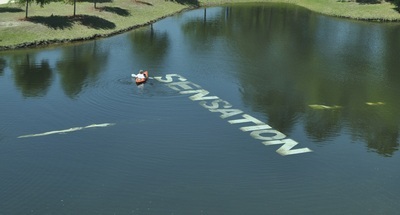 This installation was composed of three sections, each linked to the other, as if by “evanescent” sensation. 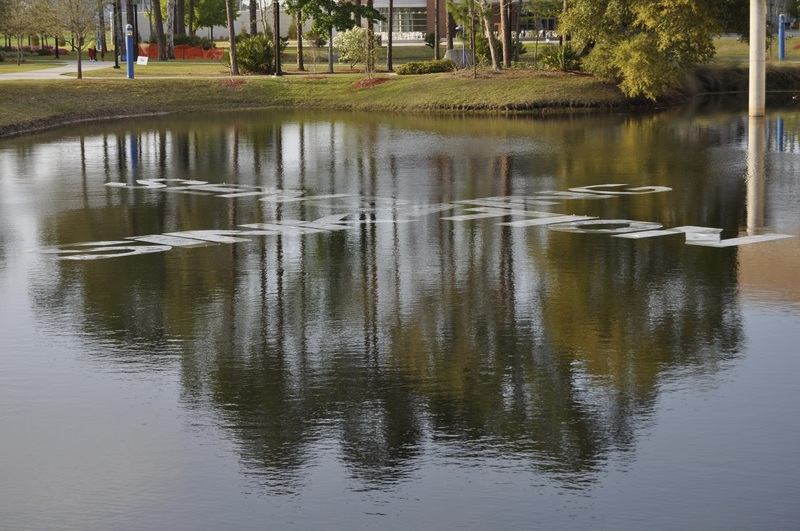 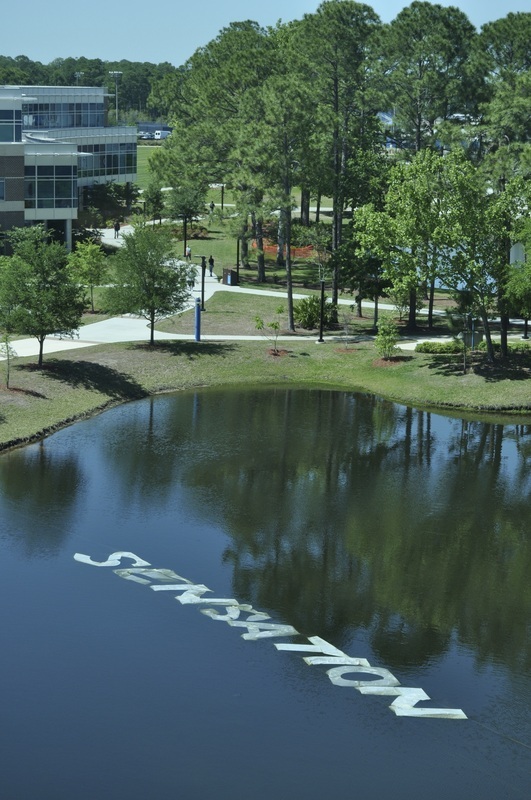 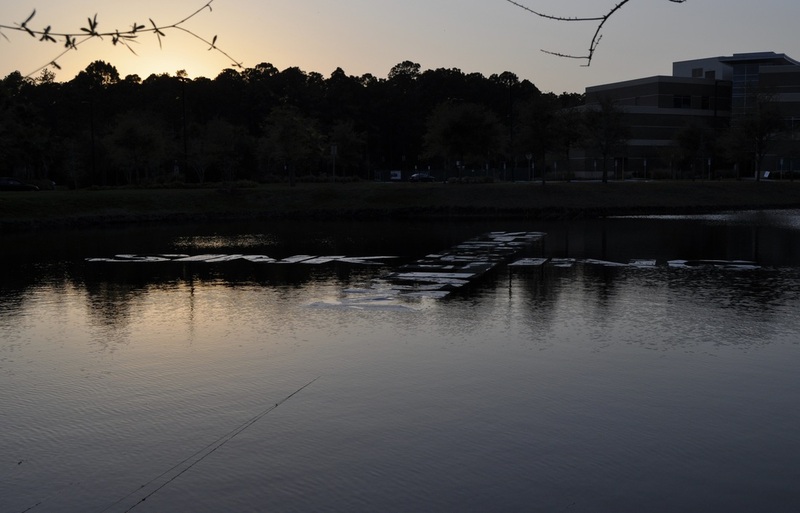 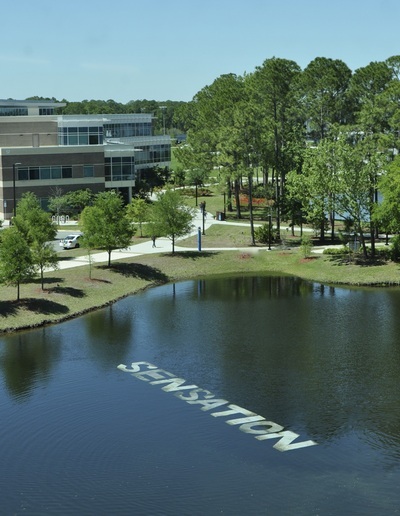 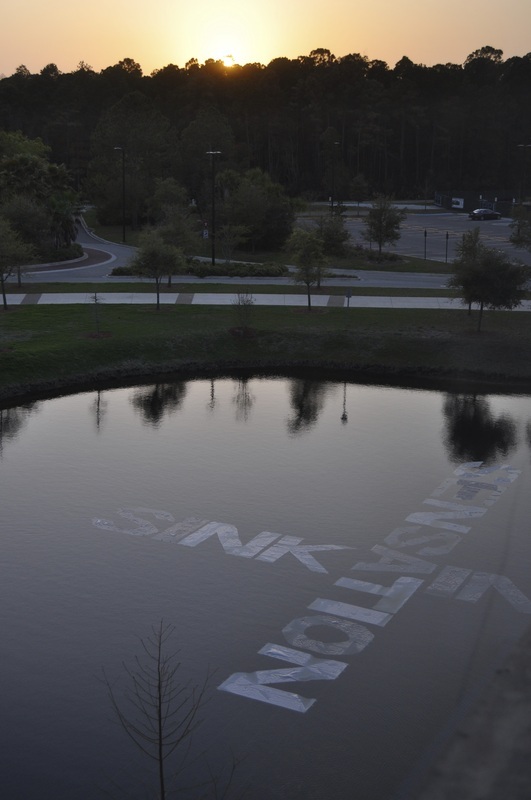 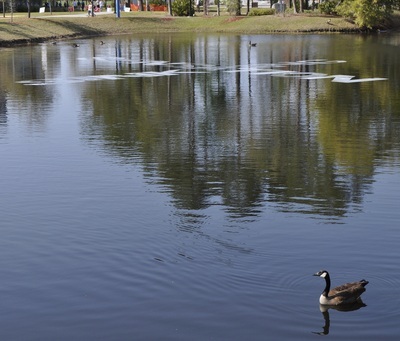 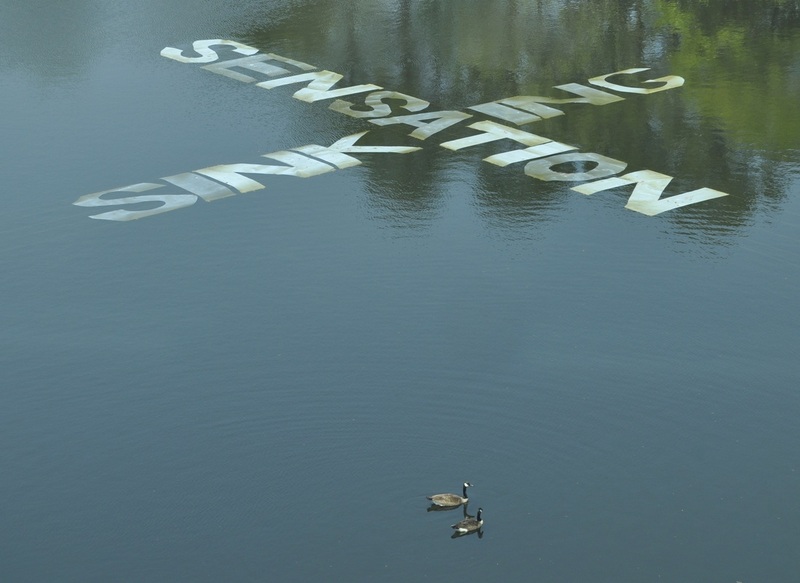 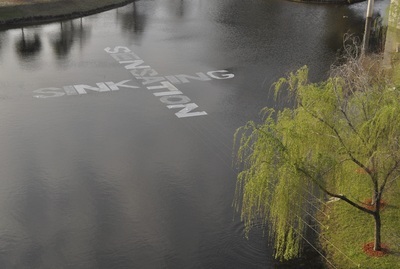 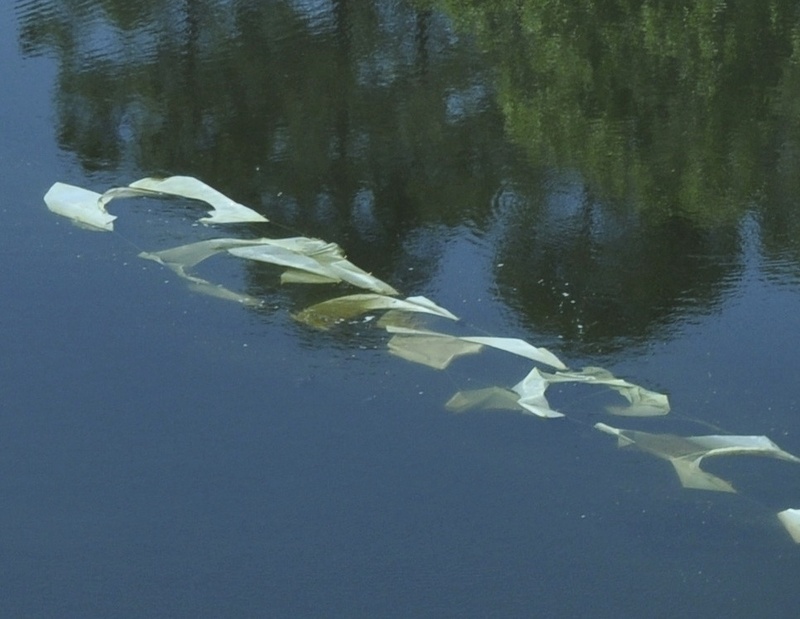 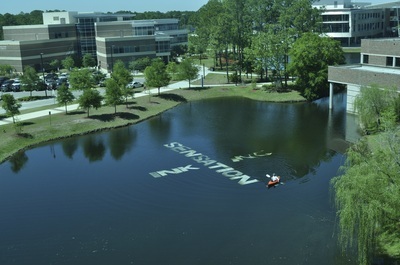 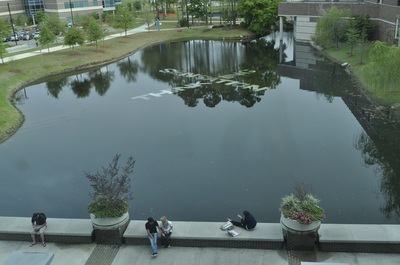 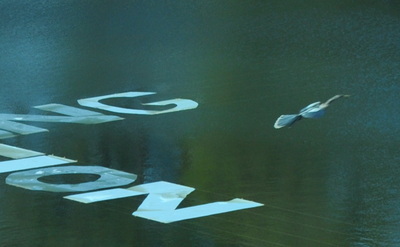 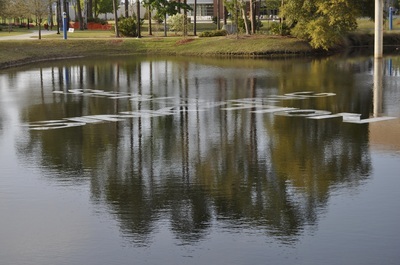 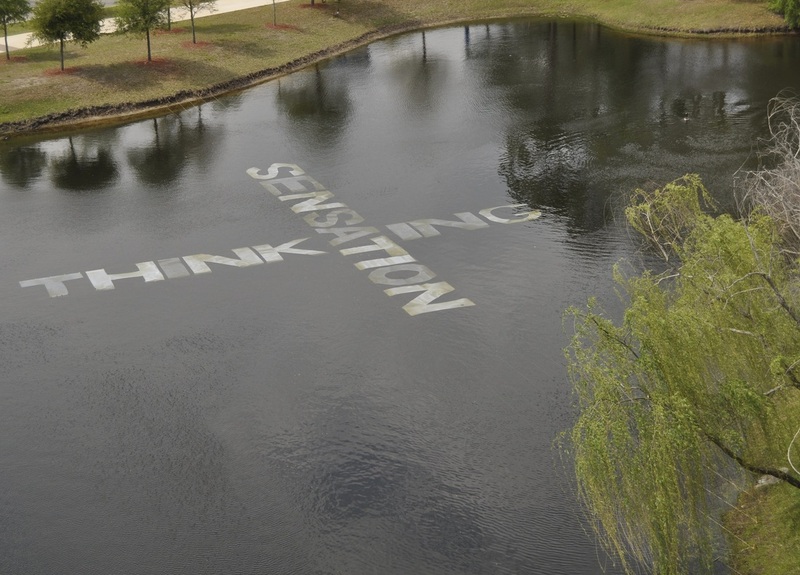 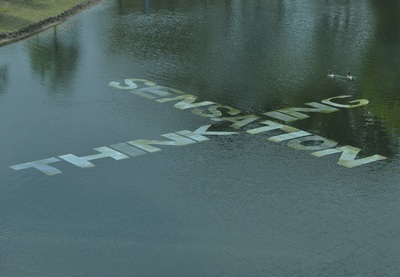 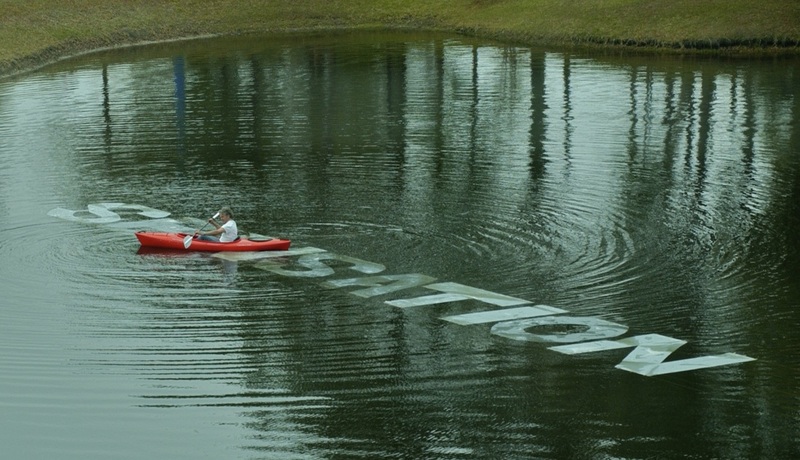 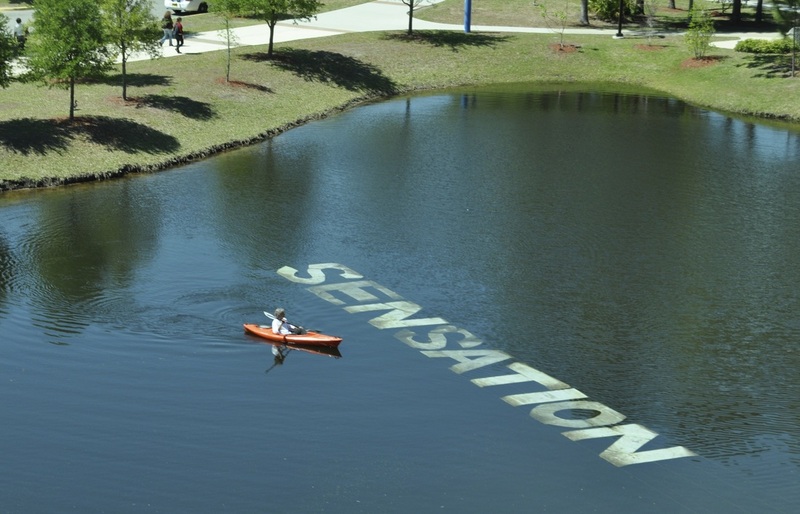 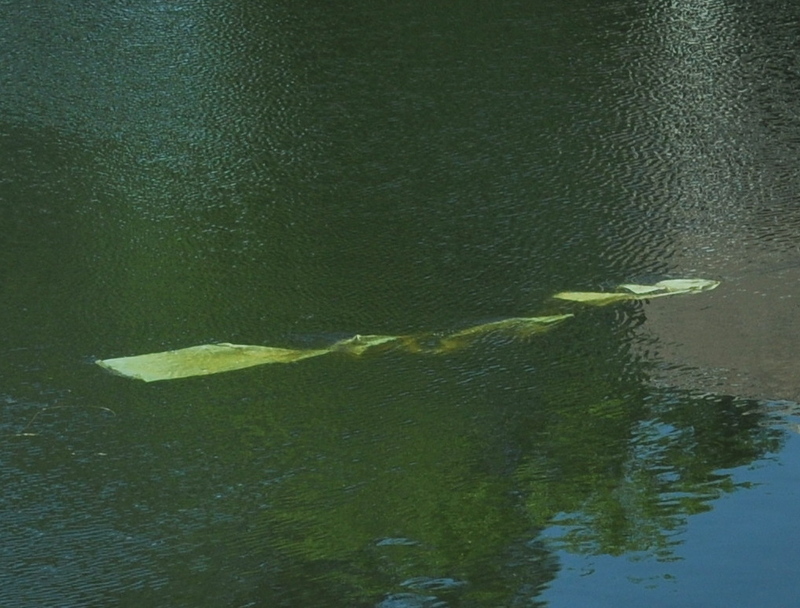 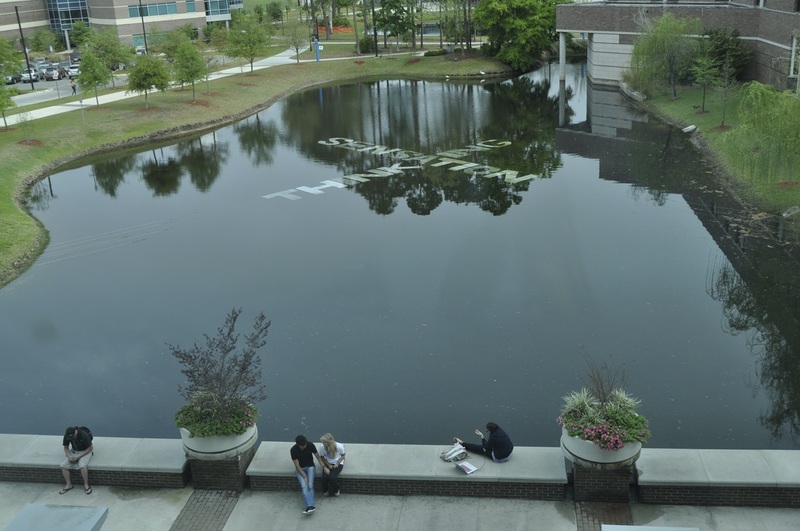 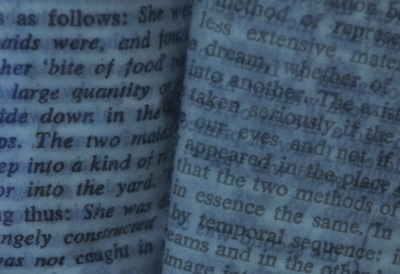 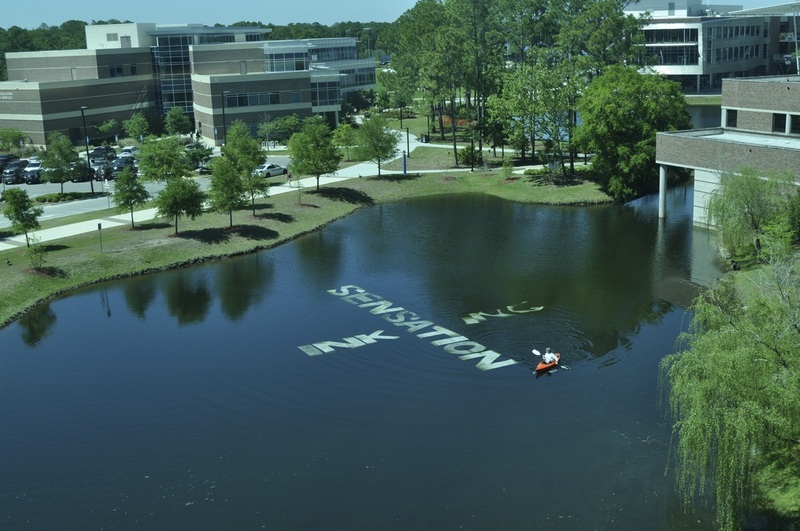 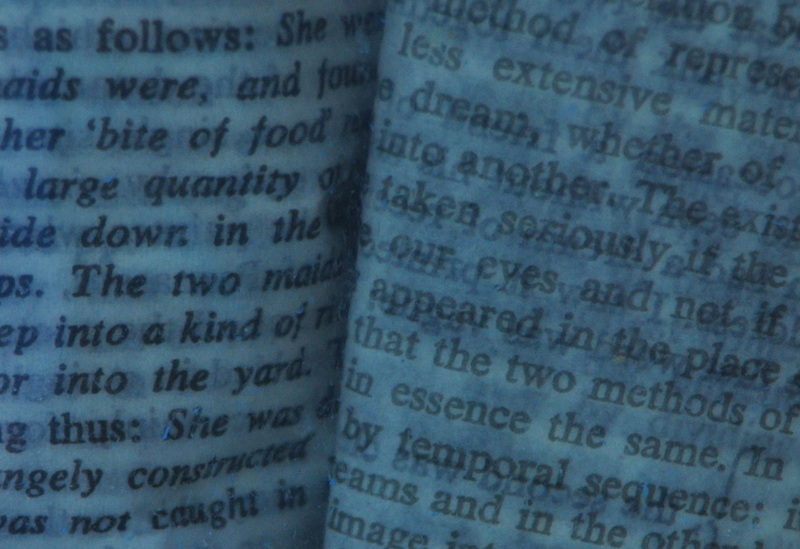 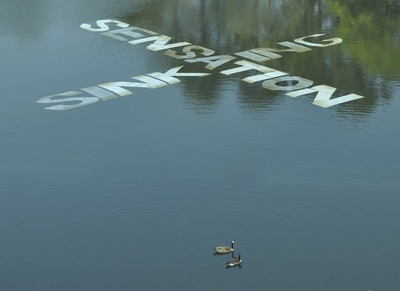 Section One: On the library’s pond, during this installation’s first week, the intersecting words on the water read SINKING SENSATION; during the second week, with the S of SINKING changed to a TH, it became THINKING SENSATION; and, finally, during the third week, THINKING was removed, leaving SENSATION to float alone on the water. 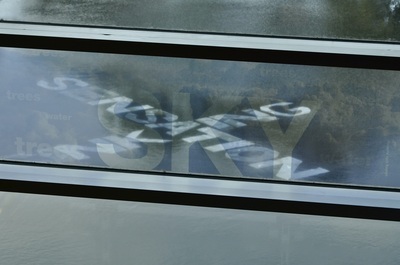 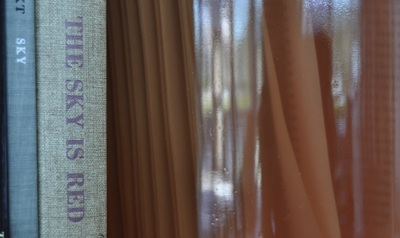 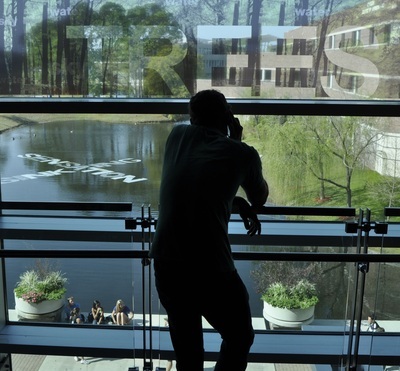 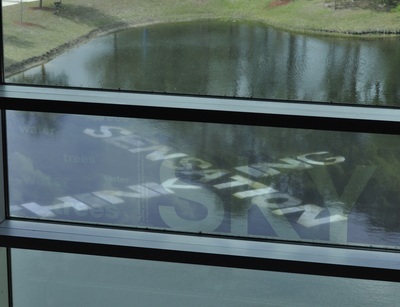 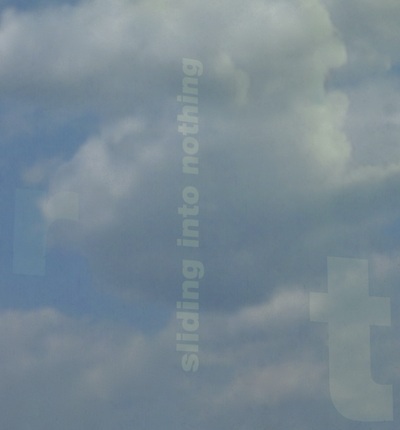 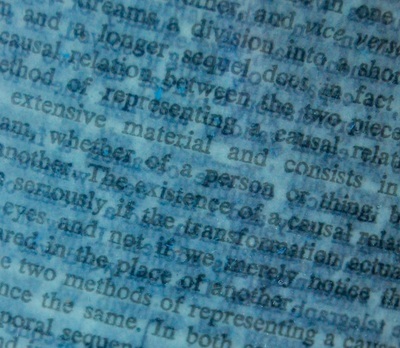 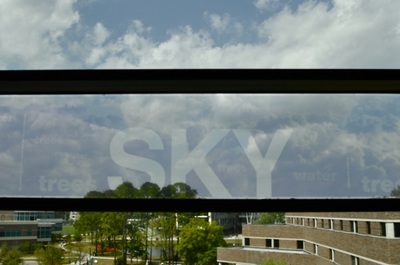 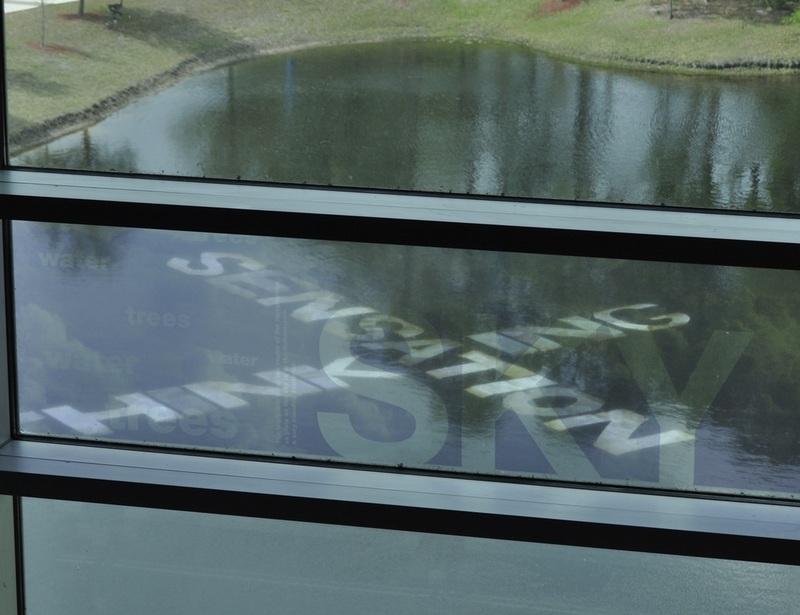 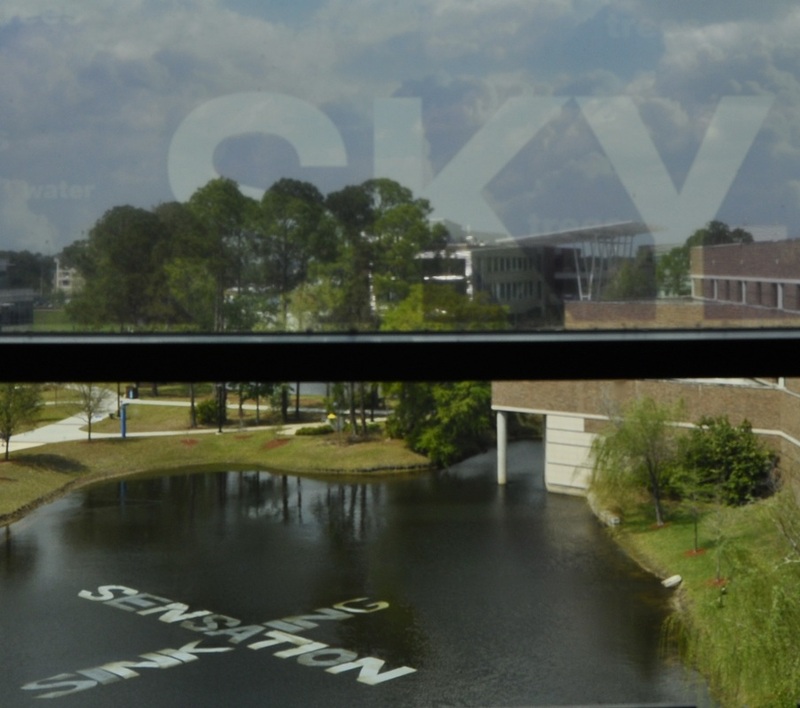 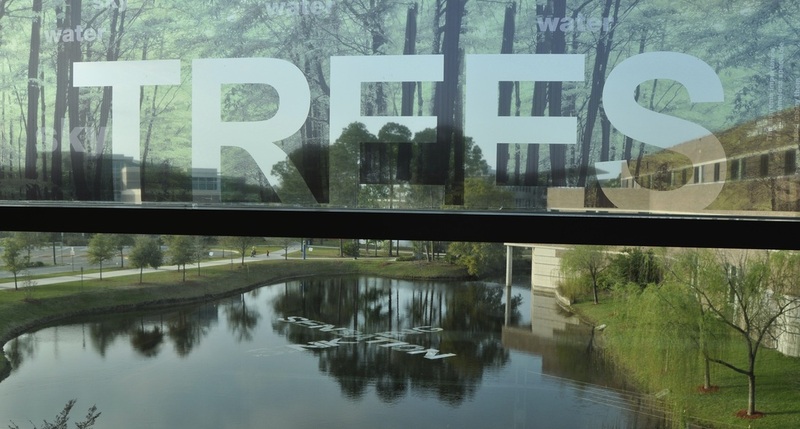 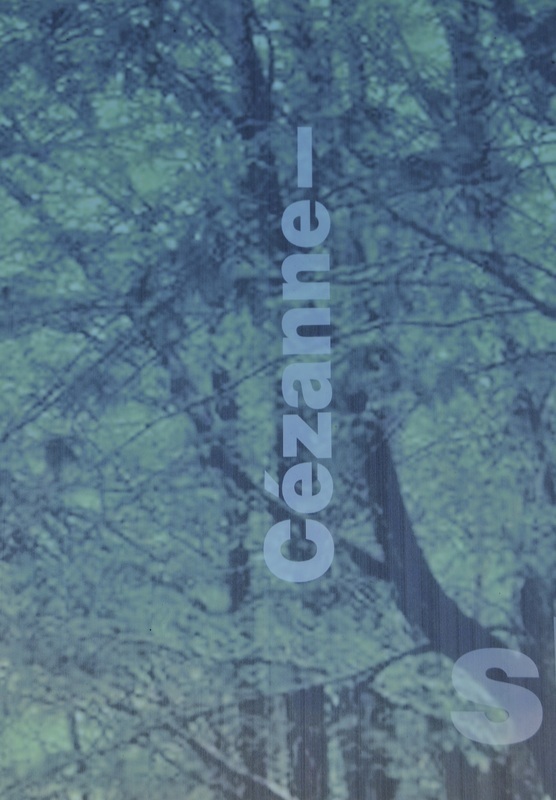 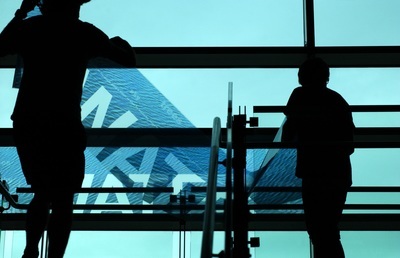 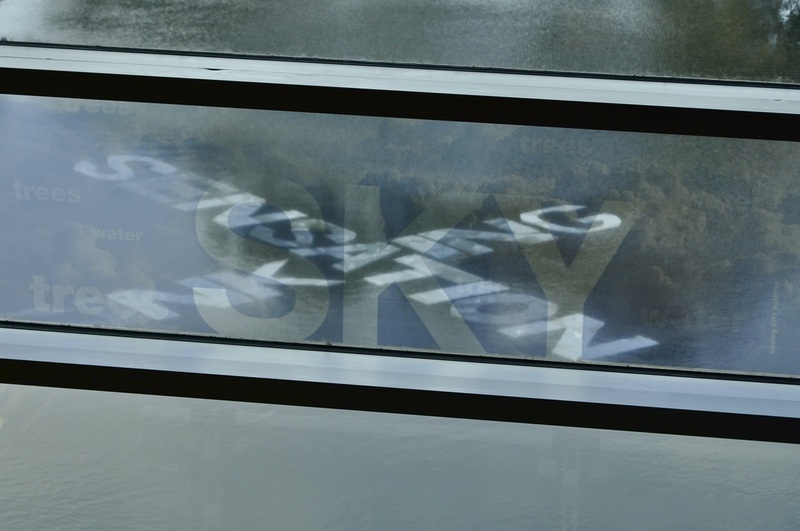 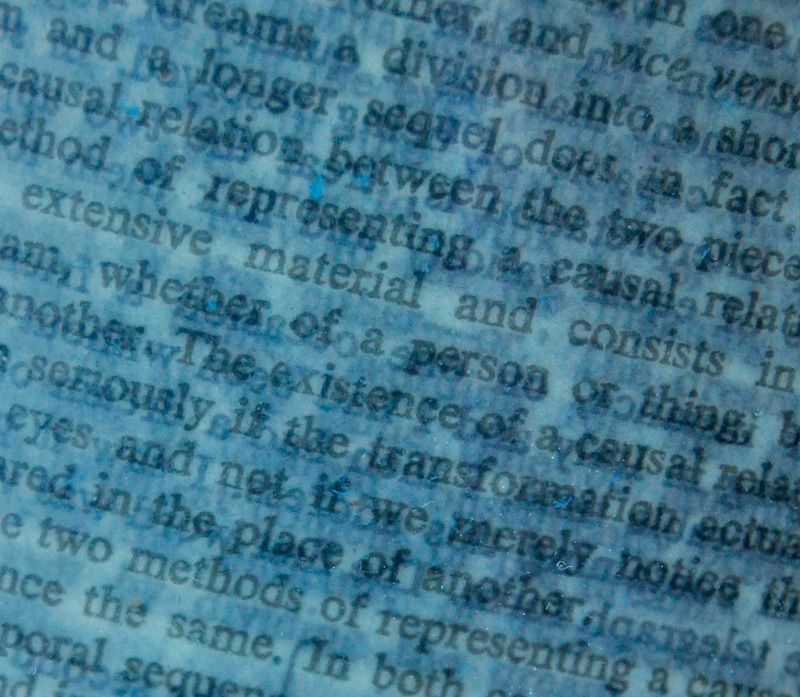 Section Two: On the library’s windows, the word WATER was printed onto a transparent image of water; above that, TREES was printed onto an picture of trees (aligning with the trees outside); and at the top of the stairway SKY was on an image of a clouded sky. 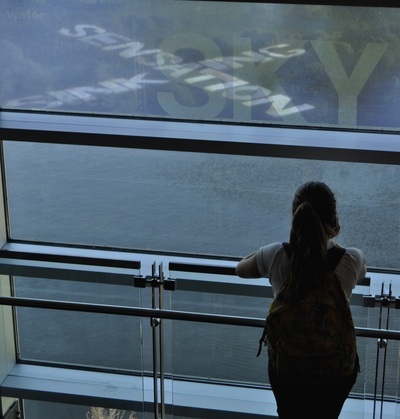 Heard throughout the stairway was a sound-collage of water splashing, geese squawking, and jets flying overhead, along with the constant noise of footsteps on stairs (creating the uncanny sensation of being followed up or down the steps). 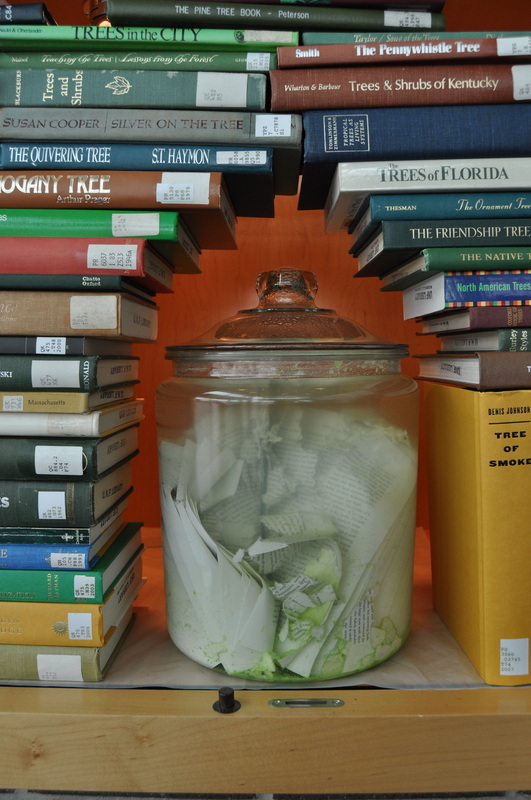 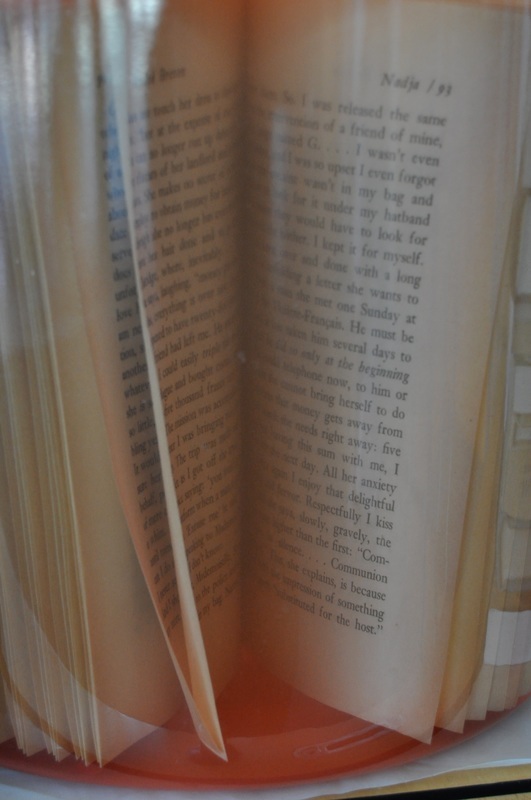 Section Three: In the library’s showcases, books were stacked tightly together, arching around large glass jars, each with a single book immersed in water. 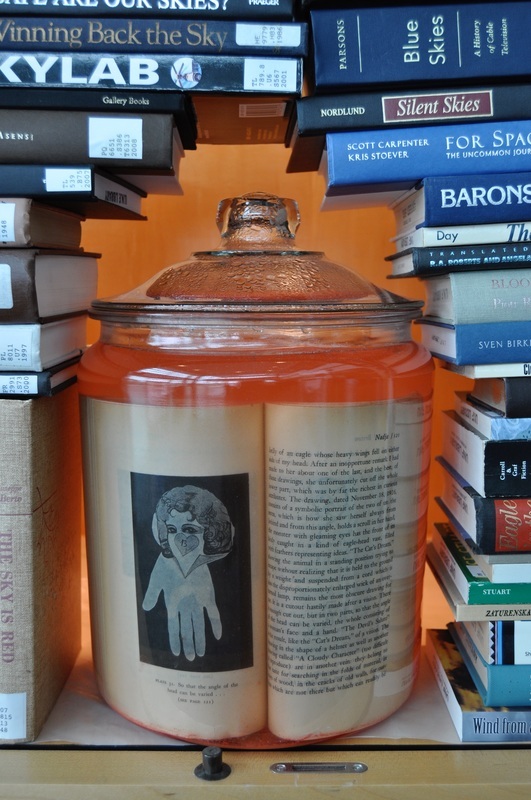 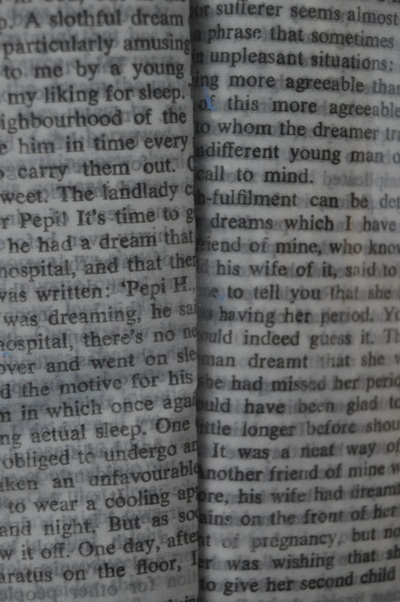 All books in the first showcase had the word “water” somewhere in their titles (with Freud’s The Interpretation of Dreams sunk inside the jar); in the second showcase, each book had the word “trees” (with Cézanne’s Selected Writings inside the jar); in the third showcase, “sky” was on each title (with André Breton’s Nadja inside the jar). 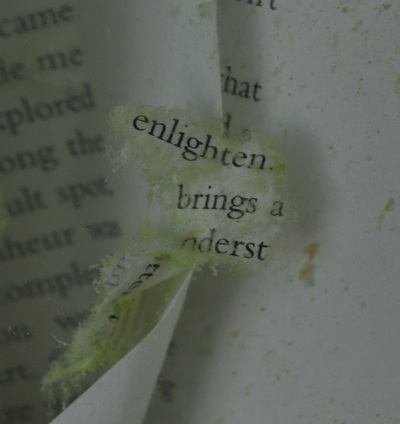 After a month in water, each of the three books had severely decayed, revealing new arrangements of language in their varied de-compositions.